Those are some of the most sobering words I’ve ever read. A month ago, I could not have known their depth nor their weight. Now I can. Here is the story of how we lost a daughter, and gained so much more. The question people love to ask when you tell them (or they see) that the woman you’re with is pregnant is almost universally, what are you having? It’s a reasonable question, of course, because what you’re having (girl, boy, twins or more) affects the trajectory of your life almost as much as the fact you’re having a child to begin with. My wife, Jen, and I like to be surprised by what we’re having. It adds a little punch to the birth itself (not that Jen would agree births need any extra “punch”). It was something we were certainly looking forward to this time around. We already have one boy and one girl so (for me anyway) there wasn’t the twinge of wanting a boy like there was during our first biological birth. Both our boy and our girl are special to me in different ways. Boys are tumultuous and uninhibited. Girls are unfailingly sweet and equally dramatic. I love them both deeply. I was simply thrilled about finding out which we were adding to our family of (soon-to-be) five. The closer we got to the due date, the more excited I realized I was. I’m getting really excited about baby No. 3. Really excited. I finally read the birth book and I realized how curious I am to find out the gender. I could not be more enthralled with that right now. I’m also hopeful Jen’s labor will be swift and steady. That was on a Monday morning. Two hours later, Jen told me she hadn’t felt the baby move all morning. She was 36 weeks pregnant. Our pastor, Matt Chandler, always says: “Your life can change with one phone call. You’re not exempt.” The problem is that I always thought I was. I thought my friends were, too. This is an illusion, of course, and about 100 minutes later I got that phone call from my wife, who said the midwife wanted her to get a sonogram because she couldn’t find the baby’s heart. If we’re being honest, we didn’t need the sonogram. It was a formality. We both already knew. We both knew as we drove to the hospital. We both knew as they put her in a wheelchair. We both knew as they went through two sonogram machines thinking one was broken. The doctor didn’t even need to say it, but she did anyway. Two words that change the rest of your life. There might not be two more devastating words. Our friends, family, and church were spectacularly gracious in the days that followed. It’s impossible for me to stress that enough. They were unbelievable. The weight was not ours alone to shoulder, which made tasting the unfolding nightmare at least palatable. John Piper once wrote that he “loves the ready tears of strong men.” I now have some old T-shirts that would agree with him. My friends came and held me, and we wept. Their wives came and held my wife, too. It was a spectacular outpouring of God’s grace in giving us deep and enduring friendships. These friends with whom we had built up 1,000 or 3,000 common days bore a part of our burden. I’m not sure how we would’ve moved forward without them, and without their prayer. The Lord sustained us throughout. We certainly did not sustain ourselves. The morning after we got the news, we sat in our car at the hospital with our friend (and labor and delivery nurse) Andrea, about to go talk to the doctor about how to get our baby out. All three of us wept softly as she prayed over us. That day felt like a thousand days condensed into 24 hours. So much of it is blurry, and yet so many moments are etched into a layer of my mind and heart reserved for the handful of days in our lives which are not mundane. Filling out paperwork in the doctor’s office that felt like taking the SAT. A long walk with a great friend around the medical center. Weeping with our pastors. Lunch with Jen and Andrea (who stayed with us all day) while balancing on the massive bouncy birth balls littered about the delivery room. The anesthesiologist coming in like Mike from Breaking Bad. No words, just business. Jen asking if she had elephantiasis after getting the epidural. It was the slowest fastest day I’ve ever had. It was also the most emotional. Before leaving for the hospital early that morning, Jen said, “God willing, this is the hardest day we’ll ever go through.” You always feel like you’ve emptied yourself of the emotion, and it just keeps coming. It is exhausting. Jen was monumental, though. I’d be remiss if I didn’t mention how wonderful she was the entire week. I was (mostly) a disaster. A mess of tears and emotions and intense pain. She was calm and confident. In the Lord. In herself. And in me. Our marriage may have been pronounced five years ago, but it was seared into my heart during this week. She eventually gave birth to our not-breathing child. The doctor showed me the gender. I looked down at my wife and told her. We had a girl. We named her Kate Noelle. Jen grabbed her out of the doctor’s hands. Stillborn births are not necessarily unique. That doesn’t dull the sting or erase the pain, but it at least reminds you many parents have walked this path. My mom had a stillborn child. Some of our friends’ parents did too. One out of every 115 pregnancies ends with a stillborn. 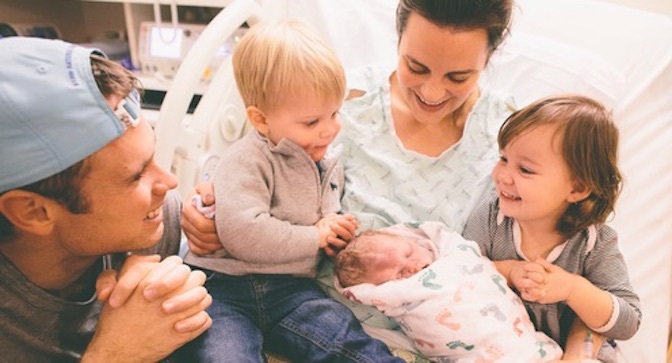 There is a couple from our church, Ben and Ashley Barr, whose son Thomas died in a similar fashion in the exact same hospital room, just one week before. They had literally walked the path we walked, and they walked it well. We took great hope in such great faithfulness. Jen asked what my lasting memory from the day of Kate’s birth was. There are many. One that sticks out is walking with Andrea from the delivery room to the hospital waiting room after Kate was born to face our friends, families, and kids. “You married a great woman,” she said. “I know,” I replied. We got to introduce Kate to her brother and sister. We got to read as a family and had Hannah sing our EFGs (in lieu of our ABCs). Hannah and Jude got to pray for baby. We told them baby was going to live with Jesus. Hannah could not have been prouder. Jude gave some questionable pat-pats to Kate, as he is prone to do. They loved her as much as they love each other. Of all the griefs we had, the toughest is probably not being able to give them something they had been looking forward to for months. They didn’t understand, but someday they will, and we wanted to have photos and moments to point to to remind them. I told my friend Josh I don’t want to protect my kids from difficult things. I don’t want them to only know good moments. I don’t want them to only see our good side, because they will be mightily disappointed when they leave home. Both in us and by how the world actually works. One of our greatest joys the entire week was sharing these fleeting minutes with our momentary family of five. Jen and I also got to spend a night in the hospital with our child. The juxtaposition of desperately needing to sleep and not wanting to waste the minutes you have left before you never see your kid again is a strong one. I slept fitfully. Everyone in hospitals does. I held Kate close while her mom rested. It was a good time. One I’m thankful we had. It was also a bittersweet night, knowing we’d never physically lay eyes on our daughter again. But Psalm 139:16 says the Lord has already numbered all our days. I’ve received about 11,500 of them thus far. Kate only received about 250. That seems unfair. But the Lord wasn’t surprised when she passed away, and we take comfort in knowing that. As we prepared to go home the next day, more friends visited and held our girl. More tears. But also a joyful farewell knowing we would see her again someday. I asked Andrea to come back to the hospital. I’ve known Andrea off and on since we were in elementary school. She is a terrific friend. I never thought I would be texting her as an adult to come help us say goodbye to our baby. Jen wanted to put Kate in Andrea’s arms. Nobody else. Driving home from the hospital without a child is not a trek I hope anyone else reading this ever has to take. It is a sad and brutal thing. All you want is to hear the thing you’ve found yourself trying to escape the last few years: a screaming child. We rested for a day and went to the funeral home on Thursday. There are only a couple of reasons 30-year-olds walk into funeral homes. None of them are good. This one least of all. We ripped through the minutia. It was surreal. Picking flowers for your baby’s casket. Picking a casket for your baby. My gosh. We chose four white roses representing each member of our family to lay around Kate’s casket for the memorial. We picked a burial plot. That destroyed me. She would be buried next to Thomas. She shared a delivery room with him. Now she shares a resting place. Jen found great joy in this. Hebrews 5:8 reminds us that Jesus learned obedience from suffering. We have felt the weight of that verse this week, and testify that it is good. We lost Kate, but we got more of God, and it is a sweet thing. There is no bitterness among us. How could there be? We aren’t even promised tomorrow. We are sustained here on Earth in the expanse of the universe only by God’s words. We are owed nothing. We are instead grateful to have met Kate. To have shared half a day with her. For Jen to have shared eight months with her. That is a gift! It is nothing else. And while Jen wanted Kate to meet her and see her face and feel her embrace, we rejoice that she saw Jesus first. I’ve always enjoyed the spotlight to a degree. I think everyone does in some way. That feels like a pretty personal thing to admit, but I’m also writing about the loss of a child, so I guess we’re beyond that. This was a week when I both embraced and loathed the spotlight. I embraced it because I was glad to shine a light on our Lord, and I loathed it because I really, really wish I didn’t need to in this way. The last of these spotlight moments was carrying my child’s casket from the hearse to the grave. I spoke with our pastor a few hours before that. He stared me in the eyes and told me that, as her father, I wouldn’t regret putting her casket in the ground. I shook as I stood in the road 25 yards from her resting place and stared at a casket the size of a wastebasket, with 15 sets of eyes staring at the back of my head. I didn’t want to move. I wanted to disappear. I wanted to wake up. Eventually, I lowered my six-pound child six feet in the ground with a pair of straps that looked like they should have been corralling boxes in the bed of our truck when we moved to our next house. I had to get down on my knees and then lay on my chest to reach far enough in to release the casket. We buried Kate with some of our favorite things. Books, pictures and drawings from the kids. We wept over the grave and laid four roses on her buried casket (even the one Hannah destroyed at the memorial). Putting a baby in the ground changes you. I don’t know how it couldn’t. We went back to the church, and I found one of those strong men I mentioned earlier. He held me again and told me things would never be the same for any of us. He’s right. A 19th-century hymnist named Horatio Spafford knew the feelings we felt that day. Spafford and his wife lost four daughters when their ship crossing the Atlantic sank. He then wrote what might be the most famous hymn of all time. We sang it at the memorial. The first verse crushes. On our way home from the memorial and burial, Jen told me she felt like she’d never worshiped like she did at Kate’s memorial. She’d never had this much on the table. In our 30-plus years on Earth, we have almost exclusively known great gifts and a rich life. I said this at the memorial, but we have a good life. We have tremendous friends, enjoy our work, and delight in our children. For a lot of us (myself included), Christianity has come easy. There’s been no suffering. There’s been no pain. There have been few questions. There’s been no reason to not trust God and to not call ourselves Christians. Now we have known unimaginable depths. The sorrow that flowed that week is an unspeakable thing. And we can truthfully say the Lord is good in both the joy and the sorrow, if not greater in the sorrow. That was what we tried to point to all week. That we do not hope in our children. That we do not hope in each other. That we do not hope in our friends or our families or in anything outside the crucifixion and resurrection of Jesus. That is all. In Christ alone. This was a wild reminder of that. One we didn’t want, but always need. My friend Nathan said that until that week, loving the Lord amid sorrow this deep was only a theory for many of us. Putting a baby in the ground makes it real. And not just for us. Our friends mourned deeply with us, which was as rich a reminder as I’ve ever had of God’s purpose in ordaining a deep community of friends. If I’m honest with myself, this is a good thing for me. Would I choose this path? Never. Would I choose any part of it for myself or anyone I’ve ever met in my life? No. But it is ultimately good for me and for my family, and that’s a really difficult thing to admit. This is why I say we lost a child (a baby! ), and gained everything. Christ is everything, or he is nothing. We lost so much, but gained so much more. We got so much more of the Lord than we ever had before. We got more of the Lord than I knew was possible for a human to get. It’s hard to describe what I mean when I say we got more of God. That is an ambiguous thing, I realize. We all saw it on each other’s faces, though. The Lord was near. We all shared a lot of joy and peace that week that wasn’t man-made. It was sweet. It was a deeply spiritual week. Probably the most spiritual of our lives. Life that week was so thick and so rich that it barely resembled all the other weeks I’ve experienced. And the goodness in all of this (and a sign of God’s spectacular grace to us) is that the only constant we knew that week is that God is still good and his grace and love roll deeper than we will ever know. He is sufficient, but he is also beyond sufficient. He is good enough to give us more of himself, no matter the circumstance. Jen says that means our faith must not waver because God didn’t change. He didn’t waver. The only thing that has changed is how much of him we carry with us. We lost sweet Kate, but we got so much of the Lord. Not in spite of, but because of her. Don’t mistake what I’m saying here. We lost a lot. We lost a child. It is every parent’s deepest fear and greatest nightmare. I honestly can’t, off the top of my head, think of anything worse in terms of sheer traumatic force applied to two married adults. But we gained even more than we lost. This is a bittersweet reality. One too complex for me to understand in full. We can now testify to the truth in these words. We have two healthy kids and one on the way. God is good. We have two healthy kids and the one on the way has died. And God is even greater than we thought he was. So now we move on. But we move on as vastly different people than we were before. All of us. Not just Jen and me. Our friends, our families, everyone who was involved. We have been grateful for that. Not only that could our burden be divvied up, but that the Lord would mature us and those around us because of this. My friend Josh sat with us in the delivery room a few hours after Kate was born and confessed amid many tears that he’d never longed for heaven like he had on that day. I thought that was a compelling and honest confession. One I tearfully agreed with and tucked away. I’ve always found heaven to be a strange thing. Or rather my relationship with heaven. It seems like a place we should long for more than we do given how twisted and disturbing the planet we live on is. And yet, I like it here. I really do. C. S. Lewis would say I prefer mud pies. That’s not something I’m proud of. It’s also something I’m hopeful will change as I continue to accept the reality that sweet Kate is there (and not here) forever. And it’s already started. Heaven is more at the forefront of my life because of that week. We’ve talked about it more. It’s a place I think about. It’s a place I want to be. Not to see the girl I lost, although that will be a good thing. But it is a pale and pathetic thing compared to seeing in full the God who willingly chose that which I would never dream of choosing. I want to meet my daughter, yes, but what I really long for is to meet the Father who gave his Son. Editor’s Note: Permission to print granted by the author and The Gospel Coalition, where this article appeared on January 7, 2016.